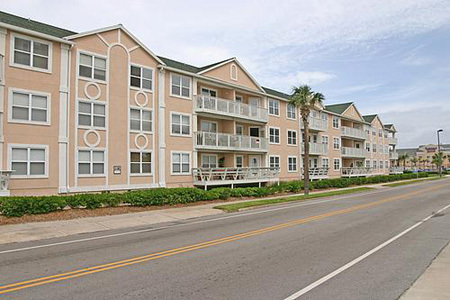 Pablo Beach condominiums in Jacksonville Beach, Florida. Pablo Beach is a condominium located across the street from the Atlantic Ocean in close proximity to some of the finest restaurants and shopping in Jacksonville Beach. Completed in 1999, Pablo Beach offers condo living with spectacular oceanviews, concrete block construction, exterior storage unit, and elevator service in the buildings. Enjoy the beach lifestyle of fun, sun, ocean breezes, and the sound of crashing waves. Jacksonville Beach offers the best of Florida living with miles of white sandy beaches and mild seasonal changes. Three expressways provide easy access to Jacksonville for business, shopping and entertainment. Friendly, laid-back lifestyle where standard attire is shorts, sandals and a smile. Minutes north of Ponte Vedra, the home of TPC, world class golf courses, resorts and multi-million dollar estates. Semi-tropical climate with breezy summers, pleasant winters, perfect springs and falls.